Advice on healthy eating/lifestyle and weight loss. Please allow plenty of time before you travel to have the required vaccinations as we cannot always guarantee you will get an appointment with the nurse immediately. PRICES CORRECT AT TIME OF PUBLISHING. PRICES SUBJECT TO CHANGE AT SHORT NOTICE. - Please go to reception desk to organise payment. - We require payment for the course of vaccination in advance. - Payment to be made via cheque or cash – we currently do not accept credit/debit cards. Non-NHS Services Medical Examinations and Certificates - THIS SERVICE IS AVAILABLE TO REGISTERED PATIENTS AT ST FILLANS MEDICAL CENTRE ONLY. Sports medicals, HGV driver medicals or mortgage insurance examinations can be arranged through our secretary. These are not NHS services and there will be a charge. Charges also apply to any certificates other than those required for statutory sick pay or incapacity benefits. Details of charges are below. Fitness to attend – school, sports, university etc. Pilot application for licence, fitness to fly etc. Please click on the link below to see our Practice Nurse Information Leaflet which will give you further details on the services our Nursing Team provides. Currently being updated - New version expected in due course. All the above are accessible by appointment only. Please telephone 01772 644140 if you require an appointment in the Treatment Room. PLEASE BE ADVISED THAT THE HEALTH AUTHORITY WILL NOT BE SENDING INVITATION LETTERS TO PATIENTS THIS YEAR. IT IS THEREFORE IMPORTANT THAT IF YOU ARE IN ONE OF THE ELIGIBLE CATEGORIES, THAT YOU CONTACT THE SURGERY TO ARRANGE YOUR FLU VACCINATION APPOINTMENT. The surgery no longer offers a dedicated Stop Smoking clinic. Our Practice Nursing team can offer help and support with this regard. Please telephone the surgery to arrange an appointment. Alternatively you can click the link below for further information. St Fillans Medical Centre, holds Arthritis clinics for patients to attend bi-monthly. A health professional who can give you advice in respect to arthritis runs these sessions. Information on services available to suffers of arthritis, tips on coping day to day. Please pick up a leaflet from the main reception desk or book an appointment to attend the next session with the receptionist. Further information can also be obtained by contacting gillp@arthritiscare.org.uk or telephone Gill on 07734 238 682 for further information. From April 2014, the government introduced a scheme for all patients aged 75 years and over to be offered an annual health check. If you are interested in having a health check please telephone the surgery fore further information. These clinics are held on a Wednesday afternoon. This clinic is now pre-bookable and appointments can be made by using our On-Line Service or contacting the surgery. The Practice offers everyone, regardless of age, a full and confidential family planning service. Alternative appointments are available in respect to Family Planning Advice on alternative days if required. Please ask the receptionist for further advice. Our Nurses are implementing a new scheme regarding the prescribing of the contraceptive pill . We hope that this will make life easier for our patients - if you are eligible you will be able to receive a year’s supply of your Pill. There is a form for you to complete (you can download it here) Once completed please bring the form into the surgery. At the same time please record your height, weight and BP on our machine in reception. Your form will be reviewed by the nurse, who will decide if you are suitable for the scheme. If you are deemed suitable, the nurse will arrange for a year's supply of your contraceptive pill. You do not need to see the nurse at this point, but of course if you would like to see her to discuss this our Patient Co-Ordinators will be happy to arrange an appointment for you. If the nurse feels you are not suitable she will discuss this with you, and you will continue to receive your Pills at six monthly intervals as previously. If you would like to discuss this further, please call us. Our Patient Co-Ordinators will be happy to help, or arrange a phone consultation for you with the Practice Nurse. Baby clinic for pre school children on Thursday afternoons 1.00 pm –3.00pm. Thursday morning 9:00am-11:00am This is run by the district midwives. If you are concerned about any skin lesion make an appointment with your doctor. 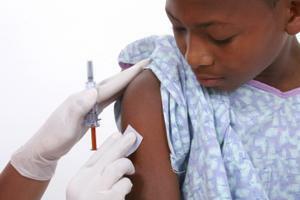 For children – When your child is due an immunisation you should receive a reminder. Children’s immunisations can be done either at the Thursday Baby Clinic or by appointment with our practice nurse. For adults – Tetanus and Polio boosters and Hepatitis B vaccinations can be arranged by appointment with the practice nurse. There are leaflets on various health issues for teenagers available at the practice. Young people can also arrange to see a practice nurse to discuss any health related issues on an individual basis. The Clinical Commissioning Group provide a phlebotomy service at the practice for anyone requiring blood tests. You will need an appointment for this which can be booked through our receptionists or the on-line services. Appointments are available Mon- Wed between 8.30 and 12.30. (these times may be subject to change at short notice). If these clinics are not convenient then there are "walk-in" clinics available within the Preston area. Please ask reception for further information.